With Eisenstein, you confront a demonic, baroque visual theatricality, helplessly adhering to the confused theories of his writing on film. And he was quickly in decline…There are those who still acclaim him, but his influence is now very hard to detect. When I took film classes in the late 1970s, the official line was that the history of film reflects a constant struggle between realism and expressionism. The contrast could be traced all the way back to the Lumières and Méliès, and in classical theory to its canonical expression in the writings of André Bazin and Sergei Eisenstein. I dutifully read both volumes of What is Cinema? and the two collections of Eisenstein essays edited by Jay Leyda, Film Form and Film Sense. It being the 1970s, Eisenstein was in the ascendancy and I was most fond of such masters of montage as Nicolas Roeg, Francis Ford Coppola and Sam Peckinpah. So David Thomson’s sour evaluation in his influential A Biographical Dictionary of Film (which first came out in 1975) was all the more challenging. Almost three decades later, and in lieu of a somewhat more traditional filmic biography, I here attempt to answer that challenge by defending Eisenstein’s theories as well as his craft. It is true that his cinematic practice grew out of his theorising, but that was only natural for a Marxist engineer who came to the cinema to express his ideological fervour. The son of a Jewish architect, he studied to be an architect himself and, after distinguished service in the Red Army as an engineer, joined the theatre as a painter and designer. He soon became director of the Moscow Proletkult, an avant-garde theatre that rejected the naturalistic methods of Stanislavsky in favour of Vsevolod Meyerhold’s biomechanical approach to acting, which was based on Pavlovian reflexology. Thus began the director’s lifelong fascination with the question of how audience responses can be aroused in the theatre, and in film. Indeed, it was his prior theoretical commitments that led young Sergei to explore, invent and embrace all the expressive possibilities of montage. Crucial to understanding what Eisenstein was striving for cinematically is his seminal 1931 essay “A Dialectic Approach to Film Form”. Just as the conflict of classes drove history – with the bourgeoisie as thesis clashing with the proletariat as antithesis to yield the triumphant progressive synthesis of the classless society – so too (famously, in Strike!) shot A of the workers’ rebellion being put down is juxtaposed with shot B of cattle being slaughtered and the synthesis yields the symbolic meaning C, that the workers are cattle. This technical innovation (which Eisenstein dubbed “intellectual montage”) resulted from his studies of Kuleshov’s famous experiments (which demonstrated that the meaning of any shot is contextual) and of Japanese ideograms (where two separate symbols can be juxtaposed to create a third meaning, e.g. child + mouth = scream, white bird + mouth = sing) (3). Less famously, in that same essay, Eisenstein distinguished between ten different types of dialectical conflict at the level of shot composition alone, many of which are utilised in the Odessa Steps sequence in Battleship Potemkin (1925). It was Eisenstein’s hope to harness that frenzy for revolutionary purposes, fond as he was of quoting Marx’s dictum that the point is not to understand history but to change it. In “The Structure of the Film”, the director embraced Lev Tolstoy’s version of the expression theory: a real work of art “arouses the complex of those feelings that gave birth to the composition” (4). In so doing, masterpieces like Battleship Potemkin (which was based on the successful mutiny 20 years earlier) can achieve an affect that, in Eisenstein’s words, “sends the spectator into ecstasy”. Reverting to the Greek etymology of ecstasy “ex-tasis – literally, ‘standing out of oneself’, which is to say, ‘going out of oneself’, or ‘departing from his ordinary condition’”, he set the bar high for true art. 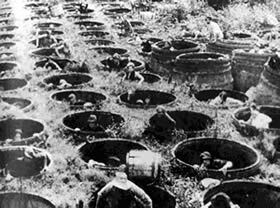 For Eisenstein (as for Marx, and Brecht, and Godard), art should raise class-consciousness and transform the viewer, ideally causing the audience to take up arms against their sea of troubles as soon as they leave the theatre. Unfortunately, it was easier for the same editing techniques to sell capitalist commodities than to engender the revolution that would lead to their extinction. Truth be told, Thomson made a few good points in his critique of Eisenstein, the most telling of which was that such extensive (and often symbolic) editing didn’t give rise to the emotional pathos the director sought. Rather, it had a distancing effect that resulted from the need to see the whole sequence in order to interpret (and respond to) the individual shots. Thomson is unfair, though accurate, when he criticises the lack of identifiable protagonists in Eisenstein’s early films, because that was part of the ideological message. According to Marx, World Historical Individuals don’t change history (as Hegel contended); economic conditions change as capitalism develops, and the people must of necessity rise up when their living conditions become intolerable. 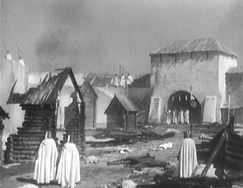 The people, not particular persons, were intentionally made the protagonists, and Eisenstein’s meticulous avoidance of the cult of the individual was a dramatic problem he recognised in later writings, addressed in The General Line (1929) and Alexander Nevsky (1938) and succumbed to totally in Part I of Ivan the Terrible (1942). Unfortunately, the writer-director was never capable of creating a believable individual character other than Vakulinchuk in Potemkin. Though he is granted little screen time as a common seaman who helps lead the mutiny, the sympathy generated by his death attests to the extent to which our identification with individuals is at the heart of much of our cinematic pleasure. 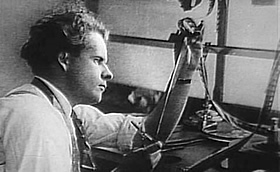 But to say that Eisenstein’s influence is no longer felt, and to attempt to debunk the British Film Institute’s canonisation of his work (which claimed back then that the artistic foundations of the medium were laid by the triumvirate of Griffith, Chaplin and Eisenstein) was unduly harsh of Thomson. Every great action film depends on the principles of rhythmic montage that the Russian formalists forged. Shooting events from multiple perspectives has been incorporated in many films since (e.g. when Jeanne Moreau jumps into the Seine in Truffaut’s Jules and Jim), echoing the sequences in Potemkin where the sailor breaks the dish and in October where the dead white horse falls off the drawbridge. The careers of Alfred Hitchcock, Brian De Palma, Nicholas Roeg, Francis Ford Coppola and Oliver Stone (to name just a few), and much of the dynamism of the music video scene, would have been inconceivable without Eisenstein’s ground-breaking experimentation. In Alexander Nevsky, he was one of the first directors to cut a film to the rhythm of pre-existent music, and not just have the music played or composed to match the film. Many of the most memorable sequences in film history (e.g., the final climax of The Godfather, with Al Pacino renouncing Satan at his son’s baptism as his henchmen simultaneously enact multiple murders at his behest) would never have been shot had the Easy Riders and Raging Bulls of the 1970s not studied Eisenstein at length in the film schools of the 1960s. You can learn a lot about a writer from his critical preferences (it is no surprise that Thomson didn’t have much use for Hitchcock either). They indicate how he defines excellence in the artistic medium in question. In the battle between expressionism and realism, David Thomson was (and is) clearly in the latter camp. His holy triumvirate, Jean Renoir, F.W. Murnau and Fritz Lang (at least his Hollywood career), were favourites of André Bazin as well, because both critics adored long takes, unobtrusive editing and linear narratives driven by individual protagonists. Bazin argued that long takes and deep focus also activate the viewer, as he or she is forced to scan the frame, detecting in-shot symbolism and interesting details of the mise en scène. By contrast, intellectual montage bludgeons us with its blunt messages. There is some force to this objection. Even Eisenstein himself was fond of describing his approach as “Kino-fist” (to distinguish his work in Strike! from Dziga Vertov and the Kino-Eye group) (5). But I am still moved by the technique, and it can be put to elegant, complex and thought-provoking use (the match cut from the thigh bone rising to the space ship in free fall in 2001: A Space Odyssey is one of my favourite examples). Furthermore, and despite my admiration for Fritz Lang, the claim that his work has had a more abiding influence on cinema than Eisenstein’s is patently absurd. As an expressionist with a fascination for Pavlovian reflexology, Eisenstein’s greatest formal innovations stemmed from his experiments in montage and its relationship to biomechanics. He tried various editing patterns, discovering that, for example, film cut metrically to the beat of a typical heart has a profound impact on us precisely because it mirrors our biorhythms. He learned how to whip his viewers into a frenzy (much easier then than now) by using such simple tricks as making the shots shorter and shorter to build to a climax (see the end of the crop duster sequence in North by Northwest for a definitive use of accelerated montage). His films were composed of an astronomical number of shots, a necessity when, say, you are trying to capture the power of a machine gun by cutting as rapidly as it fires bullets. But the shower scene from Psycho would not exist were it not for Eisenstein’s inspired lead in. I can imagine the 20th century equivalent of the Austrian emperor in Amadeus (Milos Forman, 1984) telling Eisenstein (or Hitchcock) that there were “too many shots”. In fact, Eisenstein was forced to abandon much of his most frenetic editing because of charges of formalism levelled against Potemkin and October. His attempt to rein in those formalist tendencies resulted in The General Line, which was totally disavowed by Stalinist censors (for its individualistic, Griffith-like sentimentalism) and renamed Old and New. 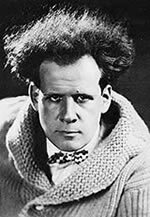 As a result, Eisenstein fled to Hollywood, where he languished for some time, beginning a film version of Theodore Dreiser’s An American Tragedy funded by Upton Sinclair, who quickly fired the clearly unsuitable émigré. He then (in 1931–32) embarked on an ill-fated South-of-the-Border documentary called Que Viva Mexico (Orson Welles wasn’t the first auteur to stall his career in the Tropics), shooting over 100,000 feet of film stock in more than a year before giving up in disgust. Upon his return to Russia, his first undertaking, Bezhin Meadow, also fell afoul of the censors, and again had to be abandoned. Desperate to return to the good graces of his superiors, Eisenstein responded with Alexander Nevsky, his most conventional, Hollywood-style epic. Stripped of most of the creative editing resources that formerly dominated his style, the images took on a posed and static quality (a vice that emerged in spades in Ivan the Terrible). Though his eye for visual design had not abandoned him (the armour of the German knights is priceless), the whole point of this State-sponsored epic seemed to be that the people of Rus would have withered before the Teutonic onslaught had it not been for the resilience of one man, his eponymous hero. No wonder Stalin loved it. Eisenstein’s work exhibits all of the strengths and weaknesses one would expect of a Renaissance Man that loved to quote Goethe and was most deeply influenced by Pavlov, Mayakovsky, Marx and Freud. 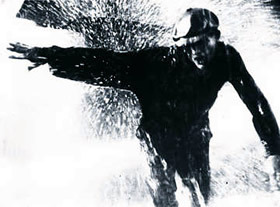 In trying to subjugate all the elements of the film to its driving idea, he (like other intellectual directors such as Stanley Kubrick) created cold epics that generate more adrenaline than genuine feeling for the plight of the workers (Vakulinchuk’s funeral is a notable exception). Bent on finding a scientific approach to his art, he generally ended up reducing his human characters to cogs in a revolutionary machine. As a propagandist (as Thomson has rightly observed) Eisenstein lampooned the bourgeoisie with naive and unconvincing stereotypes more suited to vaudeville or the circus, which soon were more likely to induce ridicule than revolutionary fervour. In Thomson’s view, Eisenstein started to decline almost immediately: Strike! was his best work, and it was all downhill from there. Why he undervalues Battleship Potemkin is beyond me, for it is clearly Eisenstein’s masterpiece, a true work of art universally acclaimed throughout the world in 1926 and ever since. Its tight, 86 minute running time is jam packed with almost 1350 shots (the 195 minutes of Griffith’s Birth of a Nation contained only 25 more shots!). The film also shrewdly depicts several brilliant Marxist insights (e.g. the link between Orthodox religion and State oppression). Strike! is more frenetic but less effective than Potemkin, and it now gives one the impression that the director was throwing everything in but the kitchen sink. The effect is centrifugal rather than cumulative; what he called a “montage of attractions” often had insufficient associative force between the separate cells to add up to something more than a kinetic jumble of parts. But, oh, what parts! 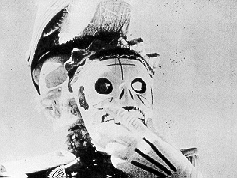 Both the structure of Potemkin and its use of Eisenstein’s signature cinematic techniques are much more obviously under the director’s control. Solidly located within a five section linear narrative, sequences build in a dramatically cumulative fashion in which montage techniques contribute to shaping coherent wholes rather than unravelling them. Dynamic passages contrast with lyrical ones, like the overtonal fog montage that opens part three. Such a structure is crucially missing in October, which, as a memorial to the Russian revolution on its tenth anniversary, was too big a project that got way out of hand. 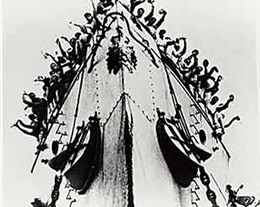 Many of Eisenstein’s fancier attempts at symbolism either fizzled (intercuts of a sphinx during the drawbridge sequence) or were too blunt (the head of the Provisional Government paired with a mechanical Golden peacock). But certain shots still linger in the memory (like the long draping hair of the dead woman demonstrator as the drawbridge rises) and whole passages can be taken for documentary footage by the uninitiated. Yes, the sheer cinematic glories of his most impressive work still shine over three quarters of a century later. The parallel editing sequence between humans and animals being slaughtered that concludes Strike! is still compelling. Though it has been analysed to death, the Odessa Steps sequence has often been imitated (e.g. in De Palma’s version of The Untouchables ) but never duplicated. The “God and Country” montage from October, where Christian iconography is reduced by stages to pagan mythology, is one of the most astounding examples of associational editing in cinematic history. And even the climactic battle in Alexander Nevsky is made periodically gripping by shot composition alone, despite the circus-like accompaniment composed by Prokoviev, the absence of crisp metric and/or rhythmic montage, and the artificiality of the ice floes. If he was inept with individuals, Eisenstein exhibited an epic mastery of crowds and crowd movement that has perhaps only been surpassed by David Lean and Akira Kurosawa (the German hordes going from a thin line to a looming presence over the horizon of ice in Nevsky reminds me of Lean). Nowhere have the masses seemed to more convincingly rise up than in the set pieces from Potemkin and October. Unlike the frequent depictions of mob violence that reflected the reactionary suspicion of the masses and mass movements that was rampant in the Hollywood of the 1920s and 1930s (see, for example, Fury [Fritz Lang, 1936]), the people are shown to be heroic, and shrewd judges of character (they mob the bourgeois racist that yells “Down with the Jews” in Potemkin). If authority figures in the traditional regime are mere caricatures, the proles are noble and reliable, at times straining credulity just as far in the other direction. By the time the first part of Ivan the Terrible was released in 1945, Eisenstein was a mere shadow of his former self, still struggling with Part 2 of Ivan and plagued with the chronic heart condition that would kill him less than three years later. Worse yet, the static iconography of his final film seemed to sanction Ivan’s tyranny (and, by implication, Stalin’s), and the second part of the trilogy he envisioned (but failed to complete) was never released in his lifetime. As a propagandist, none of Eisenstein’s efforts are as viscerally effective as Triumph of the Will, where Leni Riefenstahl demonstrated that many of his cinematic innovations could be put just as easily in service to fascism as to Communist liberation. In that sense, charges of formalism from his contemporaries were accurate, if ideologically misconstrued. One could say that Eisenstein was too much of an artist to make a good ideologue. His cinematic art will long outshine the work of the Nazi propagandists who learned so much from him. David Bordwell, The Cinema of Eisenstein, Cambridge, Mass., Harvard University Press, 1993. Ian Christie and Richard Taylor (eds), Eisenstein Revisited, Routledge, 1993. Sergei Eisenstein, Film Form: Essays in Film Theory, edited and translated by Jay Leyda, New York, Harcourt Brace, 1949. Al Lavalley and Barry P. Scherr (eds). Eisenstein at 100: A Reconsideration, Rutgers University Press, 2002. Richard Taylor (ed. ), The Eisenstein Reader, BFI, 1998. Richard Taylor, October, BFI Classics, 2002. David Thomson, A Biographical Dictionary of Film, New York, William Morrow and Co., 1981. Yuri Tsivian, Ivan the Terrible, BFI Classics, 2002. Online articles can be found here. Article on Eisenstein from the World Socialist Website. Profile on Eisentstein’s filmmaking career including a list of resources. A review of the special centenary edition of The Eisenstein Collection. Website contains images, biography, links and video clips. David Thomson, A Biographical Dictionary of Film, New York, William Morrow and Co., 1981, p. 176–77. Thomson first penned this evaluation of Eisenstein in 1975, and has not revised his opinion in the latest (2003) edition. Sergei Eisenstein, Film Form: Essays in Film Theory, edited and translated by Jay Leyda, New York, Harcourt Brace, 1949, p. 127. Example taken from David A. Cook, A History of Narrative Film, New York, W.W. Norton and Co., 1981, p. 173. Quoted in Peter Wollen, Signs and Meaning in the Cinema, Bloomington, Indiana University Press, 1972, p. 41. Dan Shaw is Professor of Philosophy at Lock Haven University of Pennsylvania, USA, edits the print journal Film and Philosophy and is co-editor, with Steven Jay Schneider, of Dark Thoughts: Philosophic Reflections on Cinematic Horror (2003, Scarecrow Press).